It’s almost that time of year! 8 tips to keep spiders out! Summer time is fast approaching. Are you Ready? 8 Tips to Keep Spiders Out! Seal up your home. Patch up cracks and holes leading from the outside in to prevent spiders from finding their way indoors. Use caulk to fill in large gaps of space in closed doors and windows. Also apply caulk around wires, cables, faucets, and electrical components, since all of these must run to the outside. Replace or fix torn window screens. Spiders can easily find their way in through even the smallest holes. Cover your vents and chimney with fine mesh insect screens. Keep your outdoor lights off. While outdoor lights will not attract spiders, they will attract other pests that can serve as appetizing food sources for spiders. On a similar note, block indoor lights from shining through your windows by using opaque blinds or shades. Consider switching to yellow sodium vapor lights. These are less appealing to insects and less likely to draw in a food source for your spiders. Remove vegetation away from the perimeter of your house. If you have a serious spider problem, consider transplanting shrubs, trees, ivy, and other plants from the perimeter of your house to the opposite side of the yard. Vegetation attracts spiders because it serves as an ample hiding spot. When spiders need to seek out warmth or new food sources, they crawl from the vegetation toward your home, getting in through cracks. Keep a tidy house. Clean homes give spiders fewer places to hide out in, making them less likely to stay even if they do slip inside. Do not leave leftover food lying around. Food crumbs will attract other pests like ants, which, in turn, will attract spiders. Regularly sweep and vacuum your floors. Wipe down your counters and tables, and avoid letting your dirty dishes sit out for more than a few hours. Pick up as much clutter as possible. Old newspapers and piles of dirty clothes make the ideal hiding place for spider species that thrive in darkness. Vacuum spiders and spider webs. One of the simplest methods for getting rid of spiders is vacuuming up adult spiders, egg sacs, and webs as you run across them. This method works best when trying to get rid of a few spiders. It may not be very efficient if you have a large spider population living in your home, however. You can also use a broom to sweep away webs and squash adult spiders, but adult spiders are usually able to escape in between the bristles of the broom. This is especially true of small spider species. Set out glue traps. Place glue boards in dark corners, beneath furniture, in closets, and next to windows and doors. Web-building spiders that spend most of their time along the ceiling are not likely to fall victim to the glue trap, but these are very effective against ground-dwelling spiders like jumping spiders and house spiders. Keep the trap flat to prevent it from curling up into itself. Discard the trap as soon as you collect a few spiders on it. Note that this is ineffective against spider eggs and webs, so you will likely need to use this method in conjunction with other techniques. Apply a residual insecticide. Spray any corners or cracks with a commercial pesticide containing some form of pyrethroid. Carefully follow the instructions marked on the label to prevent the accidental poisoning of yourself, a family member, or a pet. Pyrethroids are chemicals made, in large part, from pyrethrum plants. These plants are in the chrysanthemum family. Most household insecticides contain pyrethroids, and a few common pyrethroids include bifenthrin, cyfluthrin, permethrin, and tetramethrin. Total release foggers are not generally effective against spiders. Understand the limit of residual insecticides. These poisons only work if spiders drag themselves through the chemical after it is sprayed. If a spider manages to avoid the spray, the insecticide will have no effect on it. 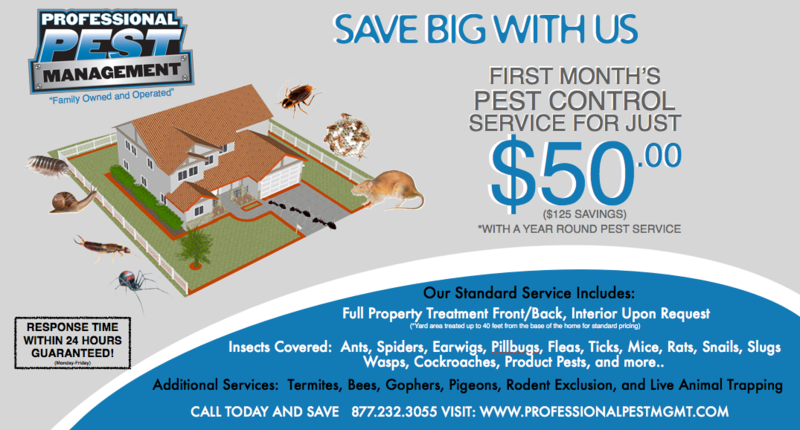 Call the Professionals at Professional Pest Management. If you have a large spider infestation and measures you take yourself are unable to control the problem, give us a call at 877.232.3055 and we can solve all your pest problems. .
Be aware that during the service you will have to be out of your home until the product dries per California law. This may be anywhere from 30 minutes to 2 hours depending on the services that are needed.